Effectively manage complex value chains, fast-paced program launches, and MRO operations. 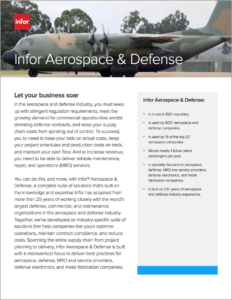 Shortening cycle times and effectively managing complex value chains, fast-paced program launches, and MRO service operations with Infor CloudSuite™ Industrial for Aerospace & Defense enterprises is providing a competitive advantage for a challenging Aerospace & Defense market. Infor CloudSuite Industrial is purpose-built for A&D industries and trusted by 800+ companies in over 100 countries.